Welcome to the four hundred and forty-ninth of my blog interviews with novelists, poets, short story authors, biographers, agents, publishers and more. Today’s is with multi-genre author Roger Hurn. A list of interviewees (blogged and scheduled) can be found here. If you like what you read, please do go and investigate further. Morgen: Hello, Roger. Please tell us something about yourself, where you’re based, and how you came to be a writer. Roger: Hi. I’m Roger Hurn. I live in London and I’m a full time writer and storyteller. On a storytelling trip to Africa the local Hausa people gave me the title Mallam Oga. This means “Wise Teacher, Big Boss” – at least that’s what they told me it meant! I’ve also worked as a teacher and taught at every level from nursery through to University. One thing I realised at a very early stage in my teaching career was that everyone loves stories. I actually believe our brains are hardwired to enjoy a powerful narrative and I found that you can captivate even the most disaffected children – and adults – with an exciting tale. I had a great time spinning stories in schools so it was a natural step for me to become a writer. Morgen: Storytelling started off as just that, around campfires and so on, so it does make sense. What genre do you generally write and have you considered other genres? Roger: I write books for reluctant readers so I have to write stories that will grab and hold their attention. These tend to be action / adventure / sci-fi / mystery / scary stories with plenty of jokes thrown in for good measure. So I think I can claim to write in most genres. Everything I write I road test in schools before I send it off to my publishers. If you’re standing in front of 300 children for an hour on a wet Thursday morning your stories have to keep them enthralled and entertained otherwise their bottoms get fidgety and they soon let you know they’re bored! Morgen: And the same goes, I’m sure, for adults. 🙂 What have you had published to-date? Roger: I’ve had over seventy books published by lots of different publishers. My most popular series is The Mystery Mob published by Rising Stars. I’ve also written the You Can Do It series for Hodder Children’s Books. The YCDI series uses comic-strip style stories and illustrations to make learning about grammar, punctuation and spelling fun and easy, with added puns, jokes and cartoons. However, I’m really excited about the latest series called Spook Squad – Adventures Too Scary for Boys (Ransom Publishing) and I’ve written it especially for all those girls I meet on my travels who tell me it’s not fair that boys always get to be the heroes in books. And the great thing is that boys tell me they want to read the books too just to prove they are not too scary for them. It’s a win-win situation. I’ve now signed with Endeavour Press, “the UK’s leading independent digital publisher” (according to them) and they are now promoting Something Wicked This Way Comes and have commissioned and published a couple more eBooks from me. Once There Were Lions (about evacuees) and The Eye of the Pharaoh (a comedy horror thriller set in a mythical Ancient Egypt). Morgen: I love that, and wow, what a variety you’ve written. Have you had any rejections? If so, how do you deal with them? Roger: I think anyone who is serious about writing has probably got a fine collection of rejection letters – I certainly have. However, the trick is to not give up. If one publisher or agent doesn’t like an idea, I take on board any criticisms they may have been kind enough to share (most don’t bother) and then offer the idea to the next agent or publisher on my list. Morgen: That’s the best way, just keep going; finding the right thing for the right person. Have you won or been shortlisted in any competitions? Roger: I’ve had my Beast of Hangman’s Hill book from my Spook Squad series (mentioned above) selected by the Book Trust for the Bookbuzz list 2012. So I’m chuffed about that. The TES have just given me a prize for one of my short stories (funnily enough, it’s not one of my favourites but then everyone has different tastes). Moreover, in July the TES published an article by me and gave every school and kid in the UK the chance to download one of my Mystery Mob eBooks for free. Sadly, not everybody did so of course but at least they had the chance! Finally, my book of folk tales: East of the Sun, West of the Moon (Rising Stars, 97818468 03697) was chosen by Scholastic Education as one of their Great Reads for World Book Day 2009. Morgen: Wow, you must be delighted. I’ve been surprised with my Story A Day May 2011 – where a couple of my least favourites (although in sci-fi and western genres which I write almost nothing in) have been others’ favourites. Do you have an agent? Do you think they’re vital to an author’s success? Roger: I used to have an agent but now so many people in the industry know me, I represent myself. Morgen: With seventy books I’m not surprised. Are your books available as eBooks? Were you involved in that process at all? Do you read eBooks or is it paper all the way? Roger: Some of my books are available as ebooks but I’ve just taken the plunge and published, on Kindle Direct Publishing, an ebook for kids / tweens and adults who like a “crossover” novel. It’s called Something Wicked This Way Comes and is a modern take on the sinister legend of the Pied Piper. It’s had some great reviews on Amazon and I think it’s the best thing I’ve ever written. Morgen: That’s great! 🙂 How much of the marketing do you do for your published works or indeed for yourself as a ‘brand’? Roger: The marketing departments at my publishers do most of the marketing, but I do author visits to schools to promote my books. I post a lot of free resources for teachers on the TES website and advertise my books on those resources. I’ve had thousands of downloads so I hope that at least some of those teachers go on to buy my books. Judging from the way Something Wicked has gone up the rankings it looks like they do. Morgen: Congratulations. Do you have a favourite of your books or characters? If any of your books were made into films, who would you have as the leading actor/s? Roger: The Alien Detective Agency, published by Badger Publishing, features a character called Sci-Fi Spy Guy who I like to think is my alter ego! A series of books I co-wrote (Tribe, published by Barrington Stoke) was nearly made into an animated TV series. Cush Jumbo, the actress from BBC TV’s Torchwood, was going to do some of the voice-overs. Morgen: Oh, what a shame. Fingers crossed it’ll still happen. Did you have any say in the titles / covers of your books? How important do you think they are? Roger: The titles of my books are decided in consultation with my editors. I usually get my way though! The covers, however, are always decided by the creative directors or the editors who chose the illustrators. I think both the title and the cover are massively important as they are the hooks that make people want to read the books. Morgen: They are indeed and this one would make a great theatre poster. 🙂 What are you working on at the moment / next? Roger: I’m working on the follow-up to Something Wicked This Way Comes (it’s called Fear the Reaper), and also on my new series GirlfriendZ – a band on the run. It’s being published in January 2013 by Ransom. It’s a set of six dystopian books set in the near future. Morgen: This is probably a silly question given everything you’ve listed so far but do you manage to write every day? Do you ever suffer from writer’s block? Roger: I do write every day. As I tell children, writer’s block is for those people who don’t have a mortgage and bills to pay. Roger: It depends. I’ve done both but I always find the characters in my stories tend to have a life of their own and take me to places I didn’t expect to go when I started writing. Morgen: Don’t they, and I just love that. Do you have a method for creating your characters, their names and what do you think makes them believable? Roger: I have drawn on my experiences of working closely with children and teenagers for the main characters in Something Wicked This Way Comes. I think living with (I have two daughters) and working with the target age group has given me the insights necessary to make my characters believable. Moreover, I trial my work in schools and listen to the feedback the kids give me. Morgen: And I’m sure you can always rely on them to be honest. Do you write any poetry? If so, why do you think it’s such a difficult market to break into? Are there any tips you could give to someone wishing to write poetry? Roger: I write songs (I play in a band) and have had a couple published. I also write poetry. Macmillan published a poem of mine in an anthology called Here Come the Teachers. I think trying to break into the market is hard if you haven’t identified a specific audience. I’m working with an award-winning graphic designer on an illustrated narrative poem: Simon the Incompetent Highwayman. It’s aimed at primary school children and we’re hoping that, because my other books sell well, we will be able to find a publisher for it. Morgen: You’ve secured renowned publishers already for your other work so that must help. Do you write any non-fiction or short stories? Roger: I’ve written a book and DVD about dance for A & C Black. Morgen: Wow. So many strings to your literary bow. Do you do a lot of editing or do you find that as time goes on your writing is more fully-formed? Roger: I do edit my work but I also think that’s what my publishers pay their editors to do. Morgen: True but presumably you’re happy with it when you let it go. Do you have to do much research? Roger: Yes, and I bless the day they invented Google! Morgen: I second that! What point of view do you find most to your liking? Have you ever tried second person? Roger: I tend to write in the third person. No I haven’t tried second person. Morgen: It doesn’t suit everyone but you write so many different things that you may like it. Do you have pieces of work that you think will never see light of day? Roger: Luckily I’m usually able to sell most of my pieces – though not always to the first publisher I offer them too. Morgen: I do like to think that everything has a place… as long as it’s well-written. What’s your favourite / least favourite aspect of your writing life? Has anything surprised you? Roger: I love what I do so, as I say to children on my author visits, if you can get someone to pay you for doing something you love then you’ve got it made. I don’t like it when editors don’t get the jokes that children love and insist that I remove them. Morgen: That is a shame – you’d hope they know their audience but then I volunteer for a charity who don’t have a clue how the shops really work. What advice would you give aspiring writers? Roger: Listen to advice, try out your work on your target audience, never give up. Roger: Charles Darwin; Leonardo da Vinci; Charles Dickens. All three are god-like geniuses. Presumably if I had the power to bring these guys back to life I would also have the power to bring back Escoffier to cook the dinner for us. So I would and whatever he served up would be good enough for us. Morgen: If you can have the other three, you can have Escoffier. 🙂 Is there a word, phrase or quote you like? Roger: Nobody wins, but some people lose more slowly than others. Morgen: Not sure I’ve heard that before, I like it. Are you involved in anything else writing-related other than actual writing or marketing of your writing? Roger: I play in a band and write songs for the band to perform. Morgen: What do you do when you’re not writing or in your band? Roger: I play seven-a-side football every Monday night for a local team. Wayne Rooney isn’t losing any sleep about me though. Morgen: 🙂 Are there any writing-related websites and/or books that you find useful? Roger: Sorry, none that I can think of – apart from yours of course, Morgen. Morgen: <laughs> Why, thank you very much. :*) Are you on any forums or networking sites? If so, how valuable do you find them? Roger: I’m on Twitter @roger_hurn. I also have a facebook page which I hardly ever visit but I find LinkedIn quite useful. Morgen: LinkedIn’s been great at keeping me topped up with interviewees. I have a Facebook author page that I did little with but have now directed these interviews to it rather than my profile page so it’s breathed some life back into it. 🙂 What do you think the future holds for a writer? Roger: Hopefully, children will still enjoy my books for years to come. Morgen: Oh absolutely. I’m sure (thanks in the main to eBooks) that people are reading more than ever now. Where can we find out about you and your work? Roger: You can visit my website (www.roger-hurn.co.uk) and my author page on Amazon. Morgen: Thank you, Roger. Is there anything else you’d like to mention? Roger: Well, can I plug Something Wicked This Way Comes? I think your readers and their children will really enjoy it. Morgen: Of course. Is there anything you’d like to ask me? Roger: Where do you find the energy to do what you do? Your stamina and enthusiasm for all things to do with writers and writing are amazing. And the minutes never end. It’s just to call me names. ‘Now off you go and play’. Beware of Faery stories. They say that if you kiss a frog you’ll meet a handsome prince. But what if you meet someone who means you harm? Someone who steals children? Someone like the Pied Piper? Legend says he came to our world twice, once to Hamelin in 1284 and once to the Isle of Wight in 1377. This story tells of what happened when he comes back a third time in 2014. The Piper is looking for two children, Will and Alice, who escaped from his home world of Elfhame after he lured them there with his magical music. Elfhame lies in a different dimension to Earth but the Piper’s flute is the key by which the gateway between the worlds can be opened. The Piper is a member of a sinister gang led by a malignant woman known only as ‘The Hooded Lady’. She doesn’t want the children – she wants a mysterious object called ‘The Crystal Beast’, which is located somewhere on the Island. She tells the Piper to find the Crystal Beast and bring it back to Elfhame – but only after he eliminates Alice and Will! 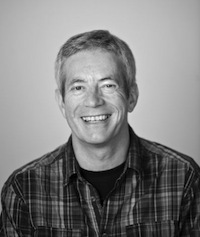 Roger Hurn is a storyteller and writer of children’s books. On a storytelling trip to Nigeria he was made Mallam Oga by the local Hausa people. The title Mallam Oga means “Wise teacher, Big Boss” – or at least that’s what they told him! Roger really enjoys writing stories that are dark and edgy, but that also have a gleam of humour to lighten the darkness. 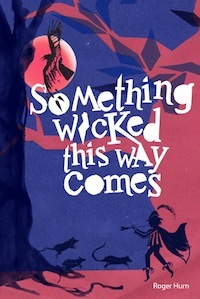 That’s why he was delighted when one reader of his novel “Something Wicked This Way Comes” wrote the following review: “… with humour and scares taking turns on the page, this book will keep you thrilled and engaged.” He hopes that plenty of other readers will feel the same way about it.